The Merriam Webster dictionary defines perceive as, to attain awareness or understanding of. Modern artists didn’t make art to annoy or anger you, trust me. If you’re angry or frustrated, talk it out. One should not be angry over art. Come on, now! 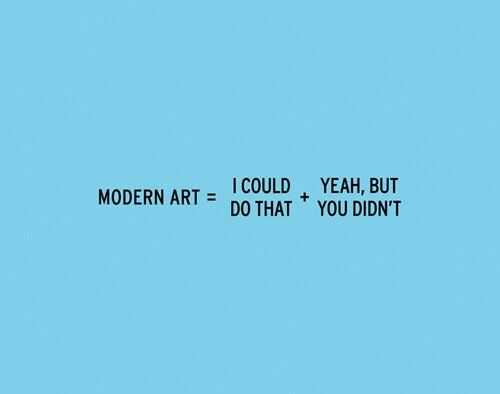 Modern and Conceptual art are NOT pointless. Question to DS: There’s a room with nothing but a TV with all these images WHAT is the point of that? Answer: To make you think…sorry, you gotta do this! Do you really want someone to ‘tell you what Art is’? Boo. No fun. I’ve got dreams (idealistic ones) about the art world. Posted in Abstract Expressionism, Art, Art Theory and Movements, Modern Period, Perception, Performance and Conceptual and tagged as art history, art movements, art writing, arts education, idealism, modern art, postaday2011.